This Belleek ornament is ready for the downhill slopes. The Belleek ornament is a bell crafted of fine china and features a skiing snowman. The Belleek snowman ornament is enhanced with a hand-painted green shamrock along with embossed skis. The Belleek skiing snowman ornament measures 3 1/2" tall; he is ready to hang on your Christmas tree with the included green cord. 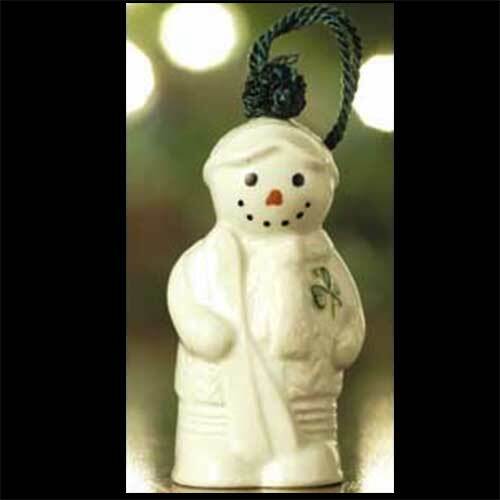 Belleek snowman ornament is a bell that is crafted of fine china; he is ready for rain with his colorful umbrella.